When measuring your lawn, try to measure in metres if possible as this will save any converting later on. 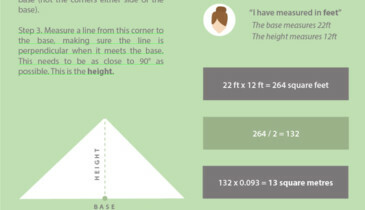 If you do measure in feet or yards however, just use our handy calculations to convert them to square metres. It also guides you through the ordering process and advice on the end figure you should aim for. We will start with the easier shaped gardens! Measure the length and width of your garden and then follow the step below depending on which unit you have used. If you have measured the garden in metres, simply multiply the two values together to get the area in square metres. For example, if your garden in 7 metres long by 5 metres wide, the area would be 7 times 5, so 35 square metres. If you have measured the garden in feet, multiply the two values together. This will give you the area in square feet. To convert this to square metres, simply multiply this answer by 0.093 which will easily convert your area into square metres. For example, if your garden is 15 feet by 22 feet, your garden is 330 square feet. Multiply this by 0.093 and your garden is 31 square metres. If you have measured your garden in yards, multiply the two values together. This will give you the area in square yards. To convert this to square metres, simply multiply the answer by 0.831 which will easily convert your area into square metres. For example, if your garden is 10 yards by 7 yards, your garden is 70 square yards. Multiply this by 0.831 and your garden is 59 square metres. Feeling a bit fancy and creating a circular lawn? If it has been a while since you left school, don’t worry! They make a very nice feature and aren’t too difficult to measure either. Measure a straight line from the centre of the circle to the outside – this is the radius. Multiply this value by itself and then multiply the answer by Pi. (If you don’t have a scientific calculator 3.142 will do the job!) This will give you the area. If you have measured in metres, you now have the area in square metres. If you have measured in feet or yards, look at the magic numbers section to convert this into square metres. Look at your garden and identify the longest side of the triangle. Measure the length of this side - this will be the base. Identify the corner of the triangle that is opposite this side (ie not the ones either end of this line). Measure a straight line from this corner to the base, making sure that this line meets the base perpendicular - as close to 90°as possible. This will be the height. Then multiply the base by the height and divide this answer by 2. This will give you the area. If you have measured in metres, you now have the area in square metres. If you have measured in feet or yards, look at the magic numbers section to convert this into square metres. If your garden is a bit of an obscure shape, rather than trying to work out a fancy formula the best tactic is to divide it down into sections. Try to split the area into squares, rectangles and triangles and measure each section separately. Once you have finished, simply add all the areas up and you shouldn’t go wrong! Whatever shape you garden is, once you have managed to work out the area you are pretty much there. If you have measured the area in metres you will now know how many square metres of turf you need. If you have measured in feet or yards simply use the numbers below to convert your area into square metres. Following these steps, you should know how to measure your garden and have the area of your garden in square metres. As mentioned previously, with the majority of turf suppliers this equates to the number of rolls of turf you will need (but remember to double check the roll size with your chosen supplier!) Once you have worked out how many rolls of turf you need, it is often a good idea to add a few extra rolls onto your order. This should cover any slight errors in measurement and having a few extra makes it easier if you have some fiddly corners to cut round.